What fun times were had in Austin, Texas in cold, wet weather while test driving the all-new 2019 Volvo XC40 as I explored the eclectic and artsy city to connect the SUV’s urbane, Scandinavian Design with local fashion innovators, music studios and inventive carpenters. The vehicle was conceived for city commutes to handle abrupt turns and stop-n-go traffic, but also fares well on the outer banks as we discovered throughout our day-long journey. 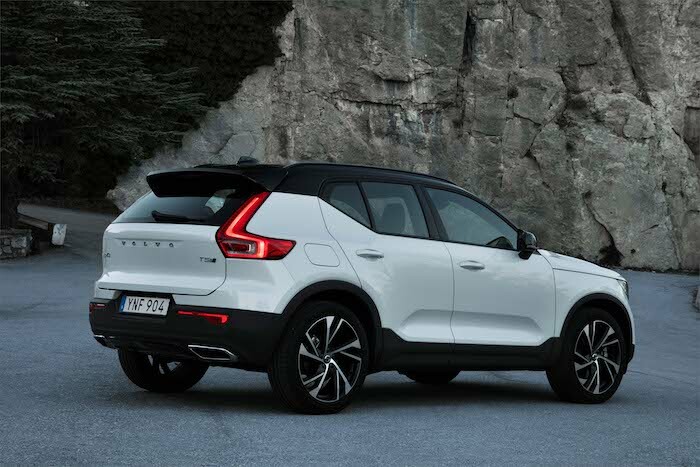 It seems as though Volvo has completed their SUV family transformation which includes the XC90, XC60 and now the present day XC40. The Swedish automaker is set with premium utilities for every customer type with each representing innovation in the field of technology, safety, styling and human interface. In fact, you will see a cadre of premium features from the larger XC90 and midsize XC60 trickled down into the XC40. This is important because the compact, premium SUV category is currently as red hot as Chili peppers. Expect the segment to continue increasing exponentially as manufacturers from BMW to Infiniti keep adding to the melting pot. The XC40 is the first vehicle to be built from Volvo’s compact modular architecture and is also designed with electrification in mind. In fact, Volvo has made a proclamation that every new automobile built after 2019 will instill some form of electrical componentry. It’s the wave of the future as the industry has no choice but to focus on sustainable vehicle development and alternative fuel sources. I mean, how much more can the planet take? To say the least, the exterior of the XC40 is refreshing while its verdant interior is relaxing and rejuvenates the mind and body. Especially when you step up to the more exclusive packages. For example, my XC40 T5 AWD R-Design model (contrasting black roof, mirror covers and headliner) was blessed with the 2-liter turbocharged engine (248-horsepower and 258 lb-ft of torque), 20” 5-double spoke Matt Black rims ($800), Pilot Assist, an amazing 600-watt, 13-speaker Harman Kardon premium sound system with Air Woofer Technology (only $800 upcharge), 12.3” Digital Driver Display, panoramic roof ($1,200), 9” touchscreen Sensus Navigation Pro, a WiFi hotspot, wireless charge pad that actually worked and much more. The vehicle’s pricing started at $35,200 and tallied to $45,835 after the $2,500 R-Design additions, eight other options and the $995 destination fee. Dully note that the XC40 T4 FWD with 187-horsepower is coming this summer. The T5’s acceleration and power meshed well with the 8-speed Geartronic automatic transmission (shift paddles) and the R-Design’s sport chassis and amendable drive mode settings. The black on silver interior theme is perfect for the tech feel of the cabin. It features a grooved metal trim that parallels with the unique grills of the Harman system. The seats are supportive and cozy as usual and the Adaptive Cruise Control (part of the Pilot Assist – Semi Autonomous Drive System) kicks in with one touch of a button. Many systems from competing brands complicate the task by requiring too many steps. I also prefer vehicles that indicate road speeds so you can be mindful of speed cameras. The XC40 is one of them. 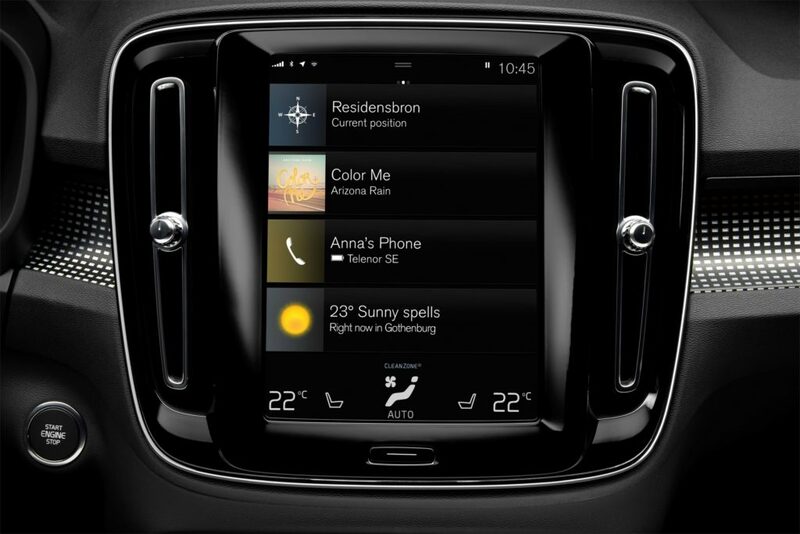 However, the Sensus Connect Infotainment System still needs work as it requires multiple taps of the screen to adjust settings (a bit distracting), and the navigation kept freezing or attempted to send us in circles opposed to suggesting more direct routes. I had to resort to my iPhone X’s Google Maps more than once. I also drove a 2019 XC40 T5 AWD Momentum model in Amazon Blue with an Ice White roof and 19” 5-spoke black white rims. It MSRPs for $35,200 and totaled to $44,315 after the 9 options and $995 destination fee. Standard features include Run-off Road Protection, LED headlights, Rear Park Assist Camera, power tailgate, Road Sign Information and the heralded Collision Avoidance by City Safety which senses cyclists, humans, large animals and other vehicles to name a few. The third XC40 model of choice in the Volvo family is the Inscription. To make the XC40 clutter free the Scandinavian design team came up with creative storage options such as the tray under the driver’s seat, the door pockets that can hold a laptop and the removable, folding load floor. While visiting furniture designer Kartwheel Studios I learned of the similarities between home storage solutions and vehicular storage resolutions by honing design techniques utilizing simplicity, daring ideologies and cutting-edge innovations. To go along with society’s new path of purchasing — basically subscription services like Spotify, Netflix, Amazon Prime, Blue Apron — Volvo has launched Care by Volvo which wraps up every cost of auto ownership into one fixed service fee. The 24-month subscription includes the negotiation-free monthly payment, the maintenance, wear and tear, 24/7 concierge, roadside assistance and the Liberty Mutual Premium Insurance Policy. You also have the option to upgrade to a new Volvo every year. Cost is $600 monthly for the XC40 T5 AWD Momentum with an array of options or $700 monthly for the XC40 T5 AWD R-Design which will also include a good amount of upgrades. Volvo is targeting two opposing demographics with the 2019 XC40. In one corner you have young, trendy buyers seeking their first vehicle purchase or upgrading their second ride. On the opposing spectrum the company is also going after more seasoned audiences that have been in a SUV for a while and presently desire to downsize. Either or, both groups will enjoy this refreshing, SUV delight. I certainly did while touring The Lone Star State.